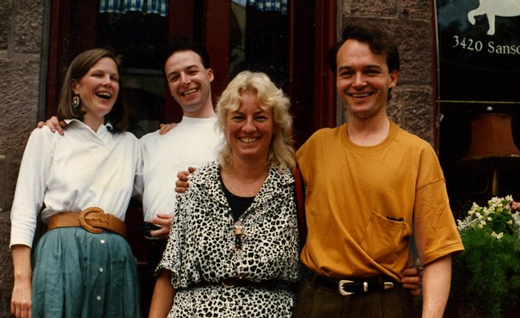 story by Molly O’Neill | Standing in front of The White Dog Café are (l to r) Wendy Born Smith, James Barrett, Judy Wicks and Kevin von KlauseDuring its 26-year reign, the White Dog Café and its satellite organizations incubated a host of talented young chefs, leaders and entrepreneurs. Today, their work continues to build upon Judy Wicks’ legacy in the realm of local, sustainable enterprise. Award-winning chef Aliza Green, first to helm the White Dog kitchen after its major renovation in 1986, pioneered the restaurant’s local food program. Although Green now focuses primarily on writing cookbooks, she also serves as Director of Culinary Development for Erdenheim’s Heathland Hospitality Group, sourcing local ingredients and developing recipes for such venues as the University of Pennsylvania’s Wharton School of Business. Kevin von Klause, James Barrett and Wendy Smith Born all bonded during their time in the White Dog circle. Then-sous-chef von Klause brought Barrett in to audition with Green for the position of pastry chef. Smith Born started in 1983 as a research/writing assistant for Wicks’ project The Philadelphia Resource Guide, then settled in as White Dog Manager. In 1993, Barrett and Smith Born left to co-found Metropolitan Bakery. Metropolitan’s 19th Street shop was the first business to provide a pickup location for Community Supported Agriculture programs Winter Harvest and Farm to City. Barrett and Smith Born also helped create the Free Library’s H.O.M.E. Page Café, which is staffed by formerly homeless teens and adults. Today, Metropolitan Bakery has outlets in Reading Terminal Market, University City and Chestnut Hill. This past February, Barrett and Smith Born opened Metropolitan Bakery’s first sit-down café, next door to the 19th Street location. Barrett says that in the early White Dog days, “local food was not easy to attain, expensive and in short supply.” However, he says, “when Kevin Klause took over as executive chef, he forged relationships with the farmers and worked to make it cost-effective.” Smith Born, having grown up in New York City, was inspired by the revelation that metropolitan areas could receive fresh, local, organic products. Fair Food is now planning to work with more conventional markets, says Karlen, including a USDA-partnered study measuring local products coming through the Philadelphia Wholesale Produce Market. Fair Food is also considering reaching out to cities like Baltimore to share the solutions Philadelphia has found. Judy Wicks’ mission, after all, isn’t just about local food — it’s about building a global web of self-reliant, sustainable economies, one business at a time.